The exhibition catalogue is available for purchase online! 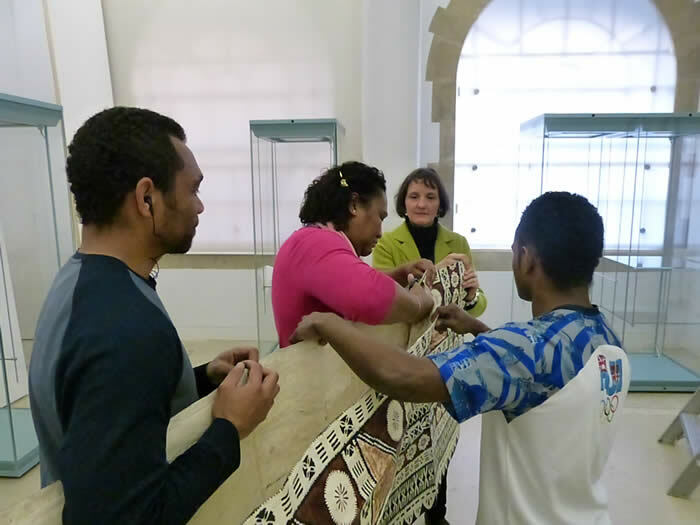 The evening before the exhibition opened to the public, the Fijian Art Research Project and the MAA hosted a group of invited guests to partake in a private viewing of Chiefs & Governors: Art and Power in Fiji. The project team was very honoured and privileged to have the exhibition officially opened by His Excellency Mr Solo Mara, High Commissioner of the Republic of Fiji. HE Mr Mara attended the opening with his wife and the Fiji High Commission London staff, who were very kind to assist in providing the guests of the opening with meke and song performances as well as Fijian food. Ms Jane West of Tourism Fiji was also instrumental in assisting with the entertainment portion of the evening. The exhibition was well received by those in attendance, including people of all ages, and we look forward to sharing the exhibition with patrons of the museum until 19 April 2014. Our great thanks and appreciation goes to the High Commission, particularly HE Mr Mara and First Secretary Mr Wainiu, and Ms Jane West of Tourism Fiji for their support and enthiusiasm towards the project. His Excellency Mr Solo Mara, High Commisioner of Fiji to the United Kingdom, opens the exhibtion Chiefs & Governors, as Prof Nicholas Thomas, Director of the Museum of Archaeology & Anthropology, looks on. 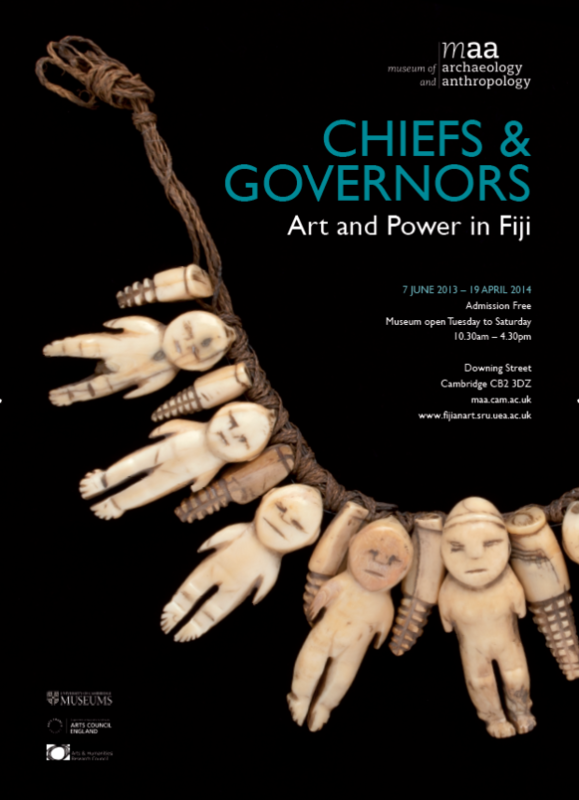 The initial stages of the installation process for Chiefs & Governors: Art and Power in Fiji began in early May 2013. 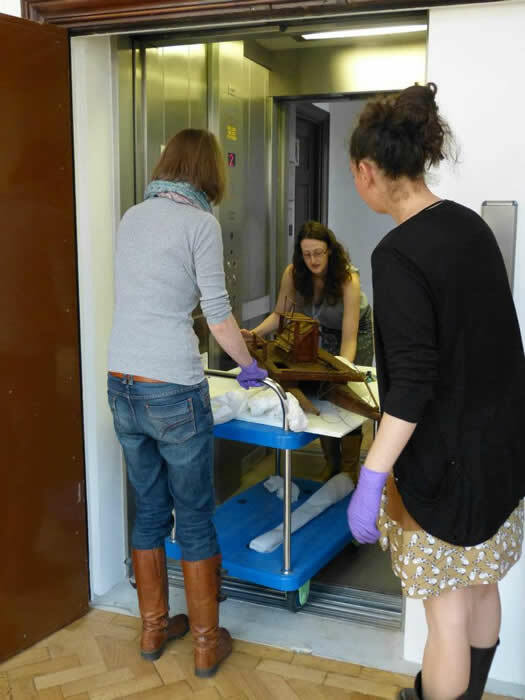 All members of MAA's workshop team have worked very hard to have plinths ready, cases positioned and mounts for objects made. Co-curators of the exhibition, Anita Herle and Lucie Carreau, have been overseeing the installation and continuing to design case layouts and text panels/labels. 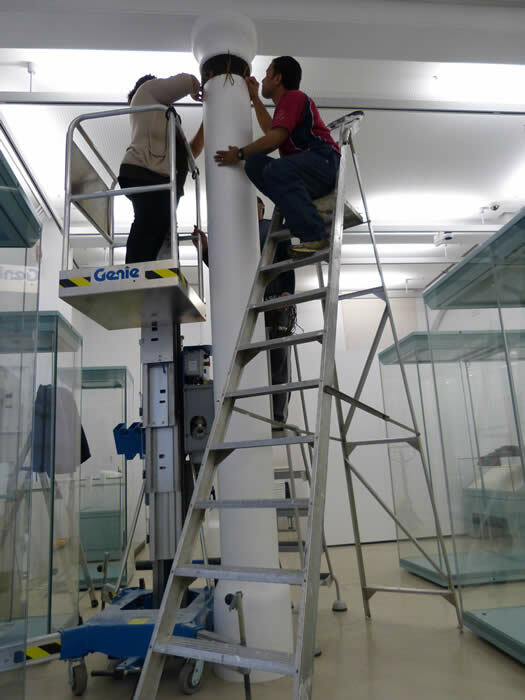 With less than four weeks to go until the exhibition's opening, everybody is very busy! 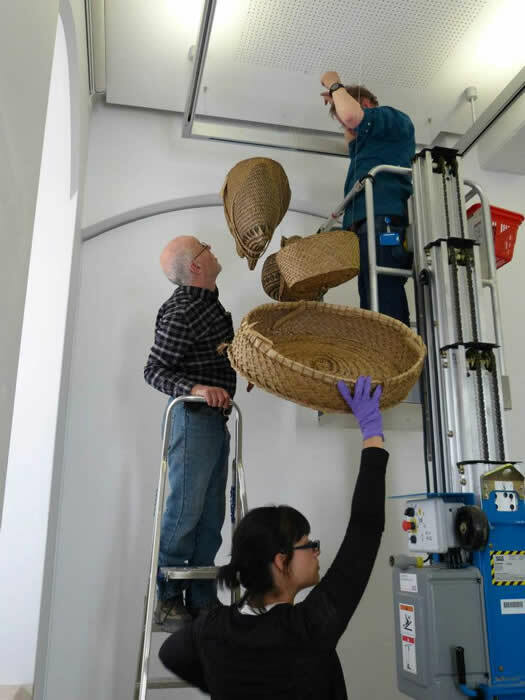 Clockwise from top: Baskets after being installed; Gordon Brown Photographing the model drua for the exhibition catalogue; Rosanna Raymond and Katrina Igglesden examining a contemporary piece of masi; Sophie Oelman, Rachel Hand and Lucie Carreau transporting the model drua downstairs to the exhibition space (photos: Lucie Carreau). 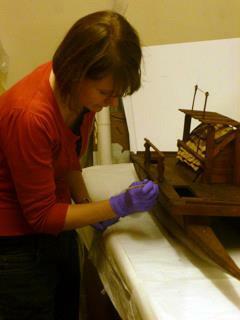 MAA's conservator Kirstie Williams has been very busy conserving and stabilising some of the Fijian objects that will be exhibited in 'Chiefs & Governors: Art and Power in Fiji', as well as preparing some beautiful Fijian barkcloth for the exhibition 'Tapa: Barkcloth Paintings from the Pacific' which opens on 1 May 2013 at the IKON Gallery in Birmingham. 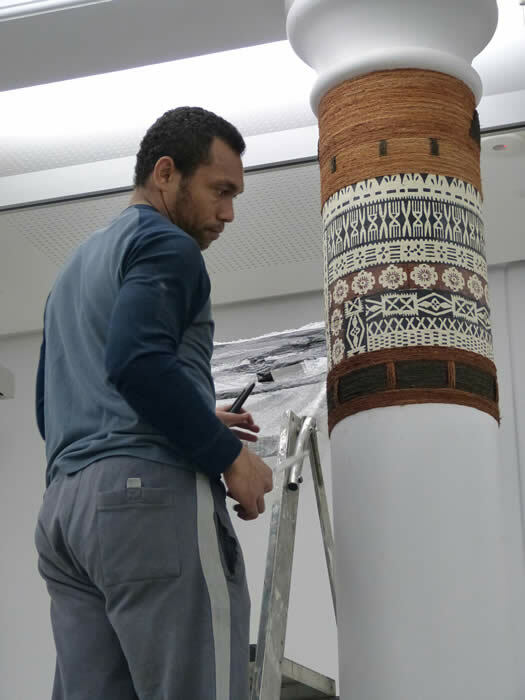 Thanks to support from the University of Cambridge Museums and the Arts Council England, MAA has received help from two additional conservators to work on Fijian material for the show. 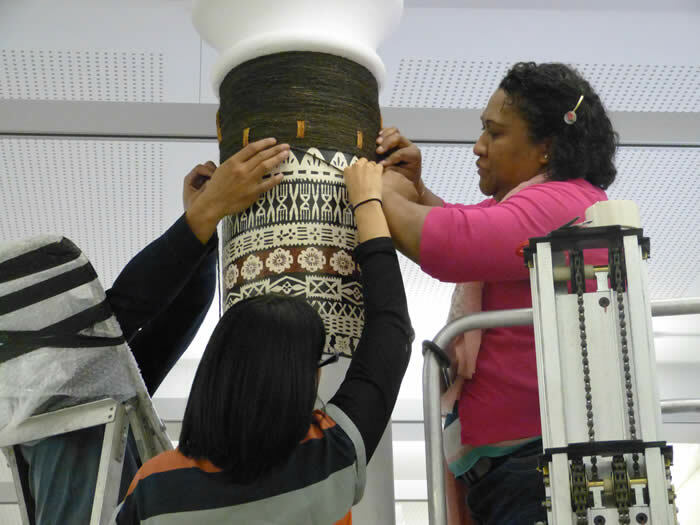 Barbara Willis has focused her attention on Tanoa Visawaqa's breastplate, reversing some previous conservation work and stabilising the object for the future. 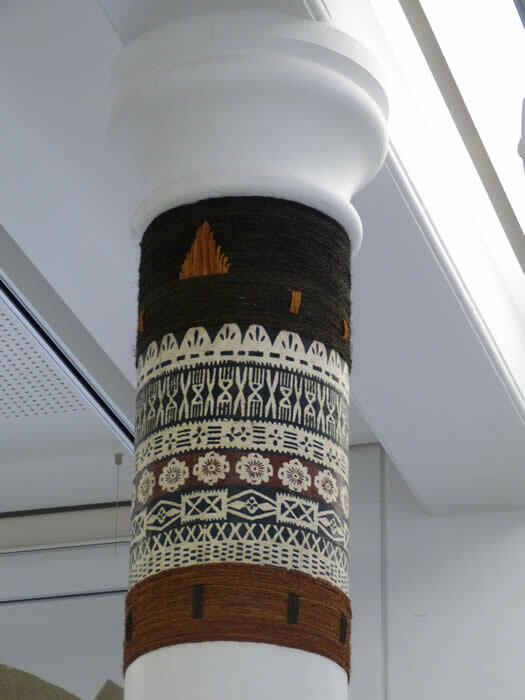 Sophie Oelman has conducted work on a number of objects, including a large tanoa and a model drua. 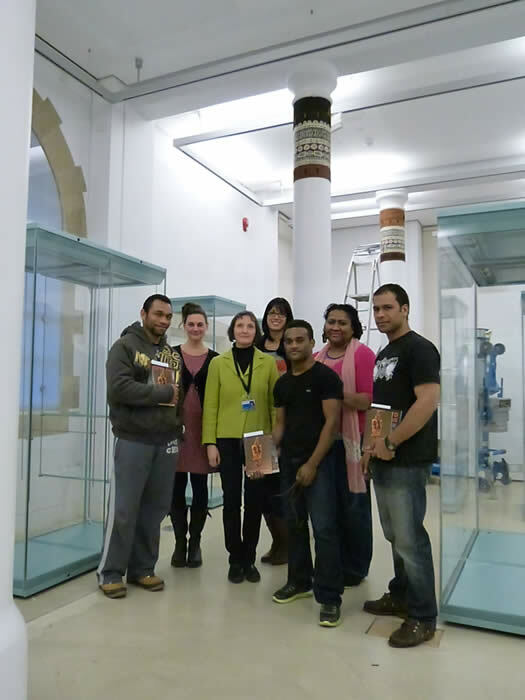 The Fijian Art Research Project team at MAA is very pleased with the results so far. 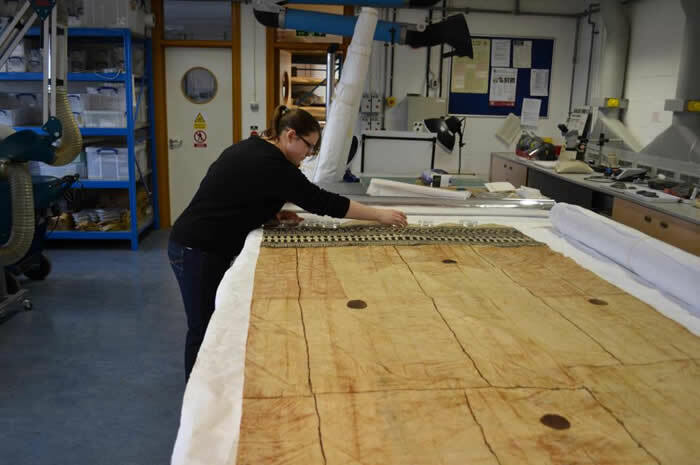 The conservation work undertaken by our three skilled conservators has revealed interesting information about the materials and techniques employed, as well as raised fundamental questions about conservation work conducted at the Museum in the first half of the twentieth century. 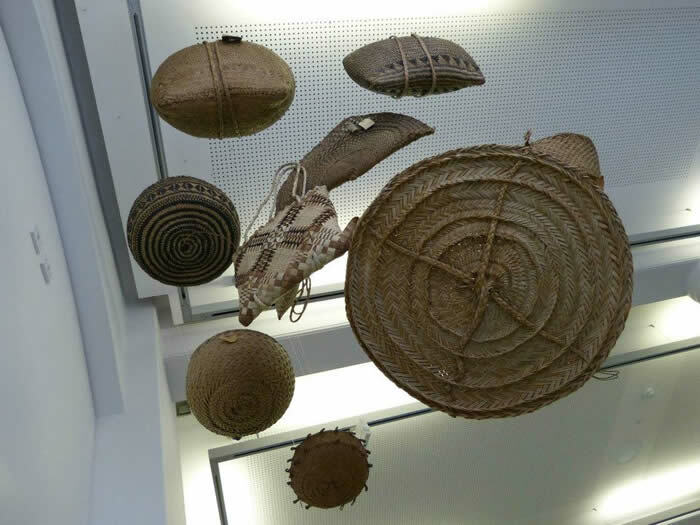 Ultimately, their work has been crucial in bringing objects back to a state that allows them to be safely exhibited and researched. 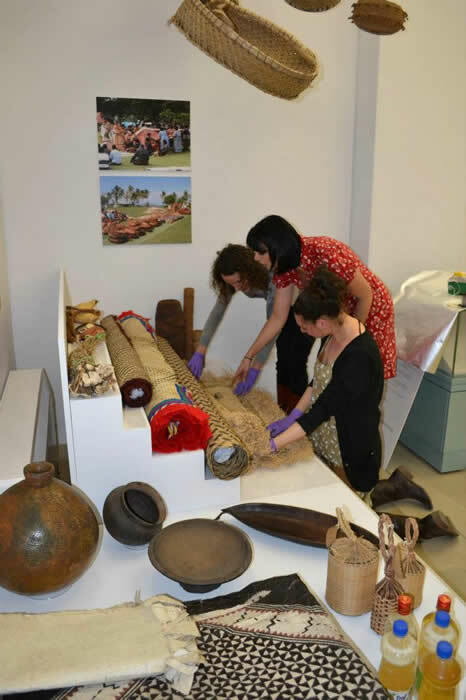 Kirstie Williams (top photo), Sophie Oelman (bottom left) and Barbara Willis (bottom right) working on conserving Fijian objects to go on display in MAA's upcoming exhibition (photos: Lucie Carreau and Kirstie Williams). 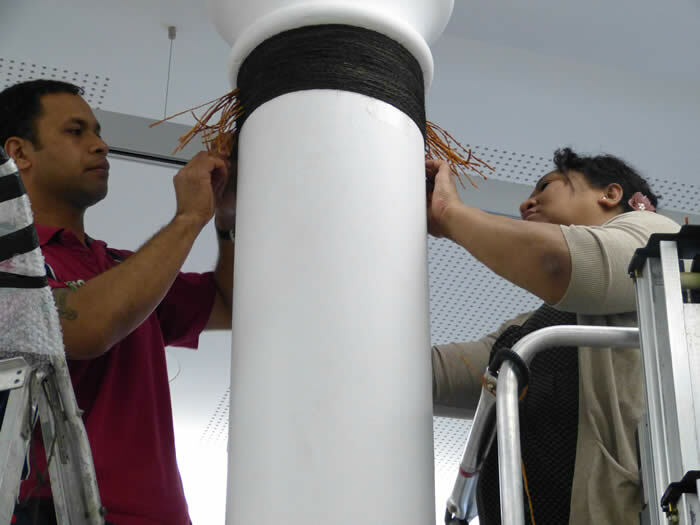 On 12-13 March, MAA was delighted to welcome Mrs Sera Tavainavesi and her colleagues Sefanaia Baleisolomone, Malakai Qoro and Manueli Tulo, who came to the museum to decorate the exhibition gallery's pillars with lalawa. 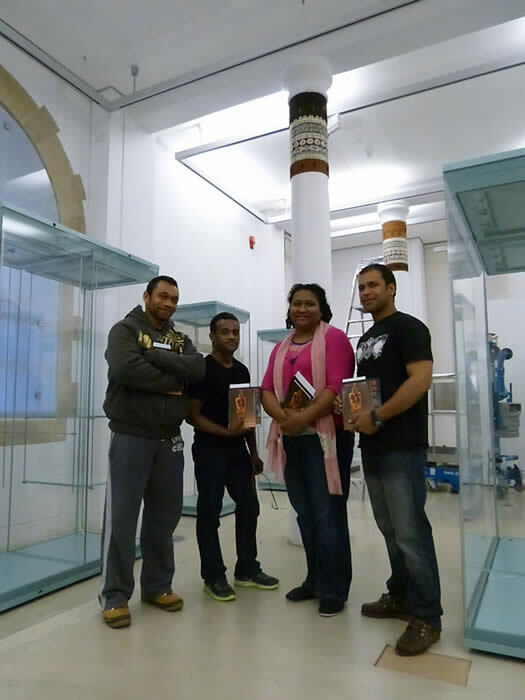 Their beautiful work, which combines the binding of magimagi (sinnet) and the application of masi (barkcloth) around the pillars, has transformed the temporary exhibition gallery into a Fijian space and has made way for the installation of the exhibition "Chiefs & Governors: Art and Power in Fiji", opening at MAA on 7 June 2013. The lalawa process being completed by Sera Tavainavesi, Sefanaia Baleisolomone, Malakai Qoro and Manueli Tulo. 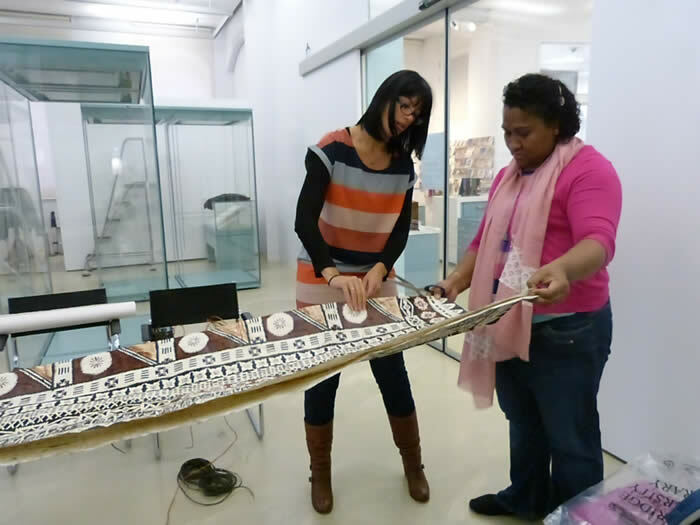 Bottom photo: Our Fijian colleagues with members of the Fijian Art Research Project team (photos: Lucie Carreau and Anita Herle). 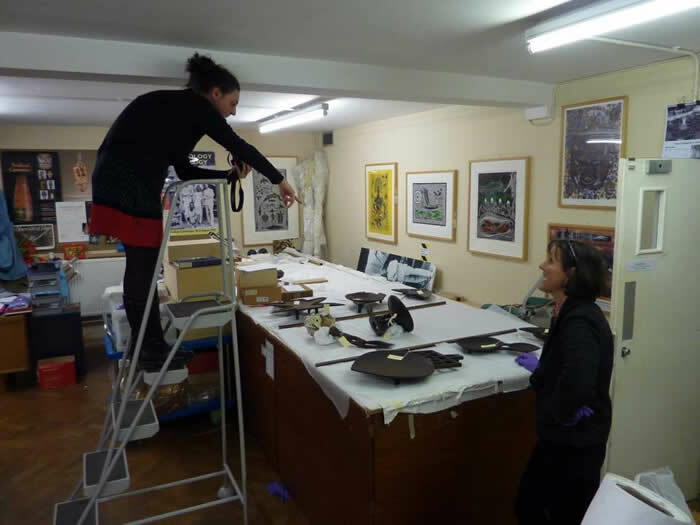 Anita Herle and Lucie Carreau have been very busy working on and developing the project's first exhibition, to be opened at MAA on 6 June 2013. 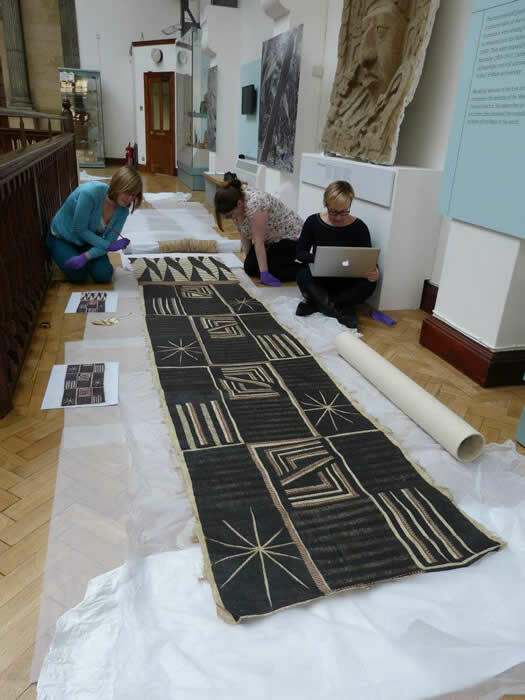 Object selection and conservation, exhibition design, photography and catalogue writing have been underway for the past few months, with all members of the project team contributing on various levels. Stay tuned to this page to see updates on the progress of the exhibition as well as important information on the opening and associated activities. 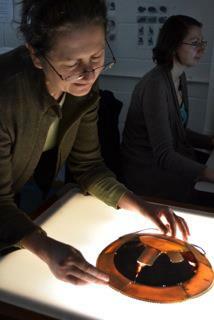 Lucie Carreau and Anita Herle in the middle of the selection process of some objects for the exhibition (photo: MAA, University of Cambridge). 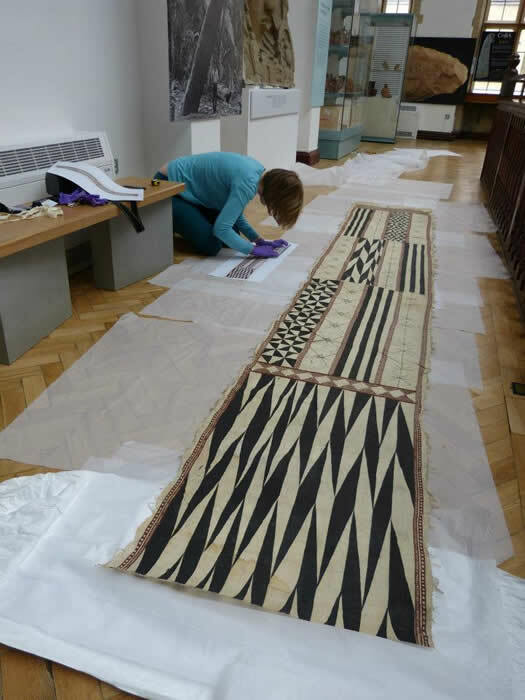 Conservator Kirstie Williams working on a large piece of gatu vakaviti (barkcloth) which has been selected for display in the exhibition (photo: MAA, University of Cambridge). Above: (L-R) His Excellency Mr Solo Mara, Mrs Kerry Mara, Prof Steven Hooper, Dr Anita Herle, Dr Lucie Carreau. 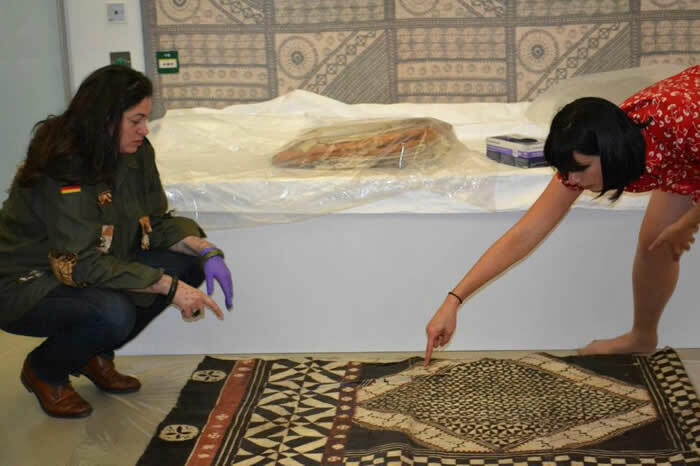 Bottom: Lucie Carreau, Katrina Igglesden and Karen Jacobs examining one of the mats that will be included in the exhibition (photos: Lucie Carreau and Steven Hooper). 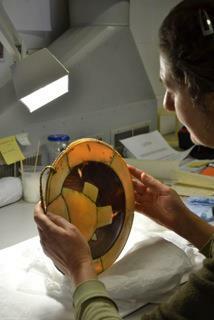 Barbara Willis examining Tanoa Visawaqa's breastplate (photo:Kirstie Williams). 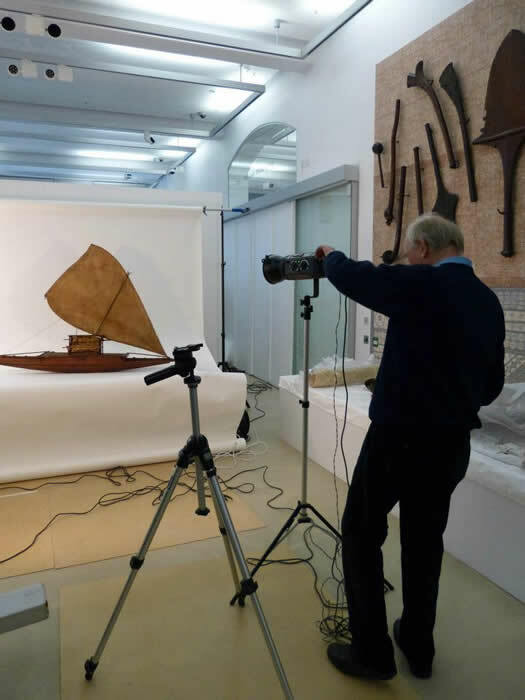 Jocelyne Dudding, manager of the photographic collection, takes a photo of a small whale ivory ear ornament collected on Viti Levu between 1875 and 1877 (photo: MAA, University of Cambridge).